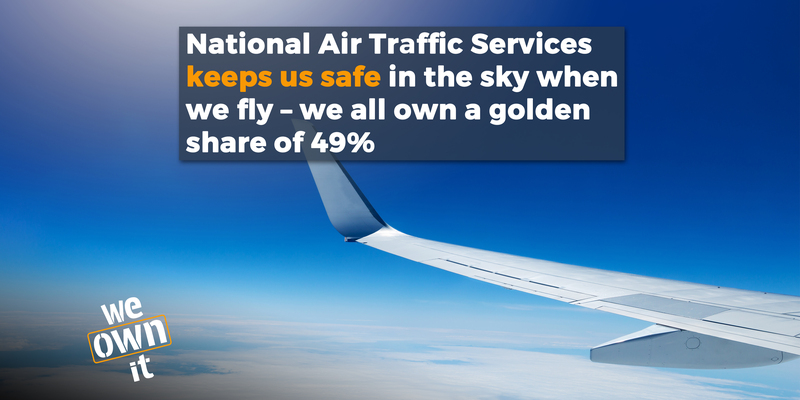 If you fly away somewhere, on your holidays or for business, it's the National Air Traffic Services (NATS) that keeps you safe in the sky. NATS is the UK’s leading provider of air traffic control services. Each year it keeps 250 million passengers safe and handles 2.4 million flights in UK airspace. You've probably used the services of NATS without realising it, just by stepping onto a plane. NATS was created in 1962 to bring military and civilian air traffic control under the same organisation. We can be proud of NATS - it's a world leader which sells services to airports and airlines in 30 countries around the world. NATS is hugely profitable. It has made around £87.5 million a year for the past ten years, and half of that comes straight back to the public purse. In 2016-17 profits were even higher at £125.5 million. NATS was partly privatised in 1998, with 51% going to private sector ownership. Today it is partly owned by the Airline Group (42%), London Heathrow (4%) and NATS staff (5%). We own 49% through our government - this is a 'golden share' meaning the government can outvote other owners if necessary. The government has proposed fully privatising NATS twice, in 2012 and 2015, but seems to have backed down for now. Our polling shows 60% of us want NATS to be in public ownership. 100 MPs signed our Early Day Motion 689 calling on the government to keep NATS public.